My neighbour is having building works done and is removing a feral colony from his roof space . Ive had an empty top bar hive in my garden for 12 months (hoped to catch a swarm last year ... didnt ) so he has offered them to me. I raised a concern about the temperature at this time of year but he used to keeps bees and assures me its alright infact a good time to do it ..
Is this true? is it ok to move bees now? seems a bit cold etc .. anyhow could do with some advise ? I suspect what ever i say it will happen in the next two weeks so whats my best chances to help them survive ? In my opinion, it is not a great time of year to do it..... another couple of months would be much better. If the queen is killed or damaged during the cut out, there is no possibility for the colony to replace her because there are no drones for a new queen to mate with. It is also a bad time of year to disrupt and stress the colony and you may lose a lot of them that are not able to re-orientate to the new location and die of the cold before they get it figured out. That said, if this building work is going to go ahead regardless, it is better to give them some chance of survival as none. The combs should be relatively stable, so handling them and reattaching them to top bars or frames will be easier and the honey probably more solid than liquid, so not as messy as it might otherwise be. The bees will hopefully be reasonably tightly clustered which should help protect the queen, but they will probably not be too happy about being disturbed. Plenty of preparation will be key to success. Making plenty of rescue bars so that you can hook the combs that you cut out onto them easily will make the job a lot easier. You will need to make a bait hive box that the same profile dimensions as your TBH but maybe just 10-12 bars long, that is portable to carry up into the attack to do the transfer and cut/trim the occupied combs to fit into it. Using a follower board as a template is helpful. It will also be quite important to keep the combs more or less in the order they are cut out and place the honey stores furthest away from the entrance and the cluster just next to them. If you leave a gap or empty combs between the cluster of bees and the honey they may die of starvation at this time of year if we get a couple of weeks of cold weather. I would leave them in the bait box and place if directly in front of your TBH, so that when you come to transfer them to your TBH when the weather is warmer.... mid spring.... they will not be disorientated too much by the transfer. If you are unfamiliar with rescue bars they are blank top bars ie. 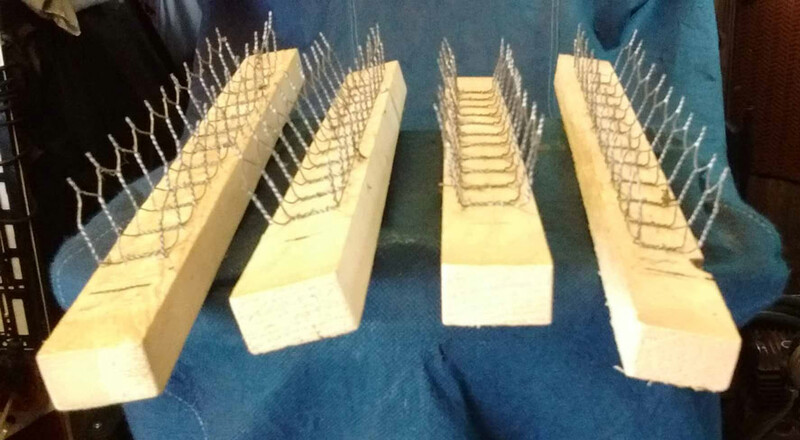 no starter strip which have chicken wire stapled to them such that the combs can be embedded into the bent over spiked ends of the wire and hang below the top bars. You will need to be very careful when you transfer the bait box out of the attic and into your garden to prevent the combs from dropping off these rescue bars as it will be several months before it is warm enough for the bees to build comb to attach them securely. Is your neighbour going to help you do the "cut out". If you search You Tube for Top Bar Cut Outs and Rescue Bars for Top bar Hives you should come across some tutorial videos that will give you a better idea than my typed words, but hopefully I have given you a few ideas of what is required. Good luck and if you have any specific questions about what I have written or anything else. feel free to ask. PS. Cut away any empty, unoccupied comb first and place in a box or bucket as that comb will be valuable to the bees later in the season, but not necessary now, so just concentrate on transferring the combs that the bees are clustered on and those with honey on. Don't be talked into harvesting the honey as they will do best being left with it to survive the rest of the winter. If there is a huge amount.... like 30-40 lbs then you can certainly take some but depending on the size of the cluster, leave them 4-6 combs of it. Thanks Ill get researching rescue bars and set about making a Small top bar hive to transfer them too ... Fingers crossed it will all go well . Do you think putting the bait hive in my polly tunnel may help ? with the aim of keeping them warmer or will just just cause more stress to the colony on the long run , as i would have to move them again in the spring ? This is a difficult situation. Transferring honey filled comb is a messy business. If the builders are going ahead with this you have little choice but to perform the cut out. - once transferred leave them be (apart from feeding if needed). The mesh needs to be spread open a bit more and the spiked ends of the chicken mesh need to be bent in at right angles so they grip the comb when the mesh is squeezed to grip the comb. Hey guys another question and an update if thats cool ? So i got home after work to a text saying the builder has removed plaster board around bees and they were not happy . So i stayed up most of last night and built a Nuc box and went around this morning an did the deed with builder .. Went ok but i made the rescue bars with to much chicken wire on and really struggled to get them to hold the comb but by that point there was no going back ! so we did out best but it was a bit of a nightmare and i don't think future inspections or moving them on is going to be easy .. but the combe went in order and the cluster went to the back ....to be honest if i can never move them on and they just survive i will be happy so..
currently we have left them in the room to settle .. the plan was to move them tonight after work to the outside .. is this the correct thing to do ? Don't worry about the comb feeling insecure on the wire to start with, they will secure it to the top bar with more comb so as long as the bar and comb is kept vertical (never horizontal) when handling, either as it comes out or even up side down, then it will be just as good as if they built directly on to the top bars. Here is a link to a photo hosting site that is free and simple to use, once joined your photos can be dragged and dropped from your file onto the Imgur site and the URL found for exactly what purpose, like forum posting, into the NBF reply window. Simple I can do it. I'm still finding my way around Imgur, so no expert, have a play. should i get the hive to its outside location tonight or leave in room for a couple days as builder said he didnt mind it there fora day or so ? Hi Glenn and well done. It was never going to be an easy job but it sounds like you were as successful as you could hope to be. I would probably give them a couple of days to settle and then move them if you have that option. When you move them it would be a good idea to place an evergreen branch across the entrance at their new location to encourage them to re-orientate when they do start flying. If we get a mild day they might just head off and then return to the roof space and become chilled and die before they figure out that home has moved. Placing thick foliage across the entrance gives them a visual cue that things have changed and they need to take note of their surroundings and re-orientate to the new location. That is great news. Have you moved them down to your garden yet or are they still in the attic? They are most likely collecting moisture from the leaves. Watch out for them taking pollen in and note what colour. There are pollen colour charts (like DIY store paint charts) online which you can use to identify which plants they are visiting. Pollen indicates brood rearing and suggests your queen survived the move. Ill keep an eye out .. back at work from weds to sunday so will let you know next week ... .